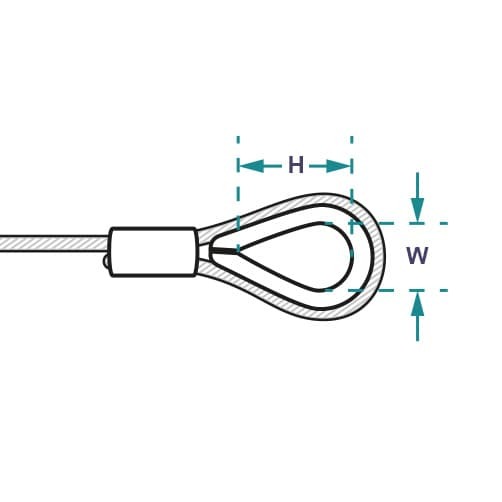 Wire rope assembly with hard eye thimble loops, thimbles reinforce and retain the eye shape and protects the inside of the loop from damage, each cable is made to measure using 7x19 strand marine grade stainless steel. 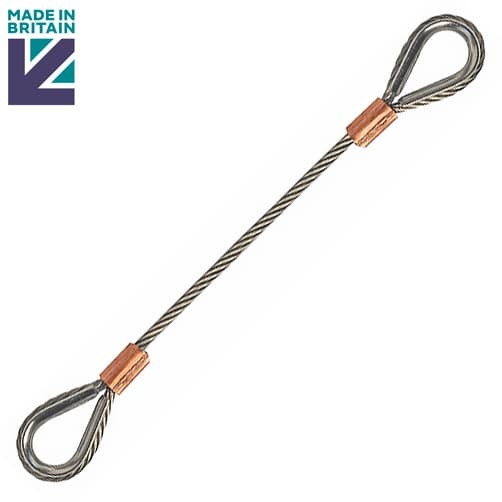 This high quality stainless steel wire rope sling with hard thimble eye loops is engineered and manufactured here in the UK. Great product. Nicely made and looks very good. Delivered to spec as ordered and seems high quality manufacture - Only just fitted, time will tell. Very good quality sling. I would recommend this company. Exactly as specified, delivered offshore on time and at a good price!!!! Canâ€™t ask for more. Exactly as described. First class. Exelent even better than what I was expecting. Made exactly to length specified and returned very quickly. Will definitely return again for the quality of service and product. Great product at a great price and look much better than using the U shaped clamps. Good quality and length exactly as requested. Wire Rope Sling with Soft Eye - Made to measure.